Were Daggett and Ramsdell ahead of their time? And just who were Daggett and Ramsdell? Is it true that there is nothing really new under the sun? 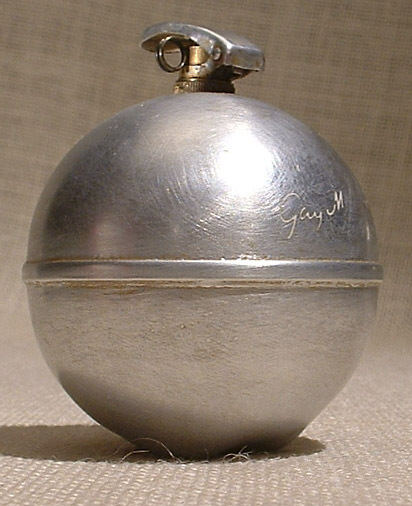 Or did Daggett and Ramsdell just luck into some war surplus grenade shells and found them to be a cheap alternative to fine glass that was currently difficult to obtain from war torn France and Italy? More likely, like Viktor & Rolf's Flower Bomb, Gay Manhattan was a sophisticated, "insiders" fashion statement. Gay Manhattan was advertised as being "so captivating it drops a bombshell into every man's heart" and "so smart it could only be Gay Manhattan." This is a perfume you would not try to walk through airport security! If you have any information you would like to share about Gay Manhattan, please use the message sender below.